Sargent & Greenleaf, Rochester New York - 1 movement, Model #4 - exclusively for Corliss Spherical safe, later modified by Mosler Safe Co. The Corliss Safe Company was founded in 1878 by William Corliss, an industrialist with a background not in lock and safe making but in steam engine construction. His grand vision and financial wherewithal made Corliss Safe an instant success. The Corliss signature design had no recognizable door, but rather a concentric rotating core and shell. The safe offered no corners, edges, rivets or welds for criminals to exploit. Corliss largest model was the Planet Safe, an enormous safety deposit safe made in a forty-eight inch, thirteen-thousand-pound model and a sixty-four inch, thirty thousand pound model. The company's Spherical, the "smaller" model was also a behemoth, available in thirty-two and thirty-six inch versions, weighing eight and twelve thousand pounds, respectively. It is not known if Corliss Spherical offered a time lock before 1888, but in December of that year S&G introduced the Model 4 single-movement time lock designed specifically for use with the Corliss Spherical. The 1895 acquisition of Corliss Safe Co. of providence Rhode Island was a sound business move that also boosted Mosler’s prestige. A Mosler history said "all of their [Corliss] large machinery was moved to Hamilton at the turn of the century, establishing Mosler as the world’s largest safe manufacturer." The name -- Corliss -- was well known and respected by industrialists and bankers. Mosler capitalized on the brand name by producing "Mosler-Corliss" products until about 1910. After Mosler acquired Corliss they continued to service the S&G #4 time locks with S&G movements until Mosler acquired the Banker's Dustproof Time Lock Co. in 1915. This marked Mosler's entry into the time lock business. Mosler experienced some difficulty in their first year of starting up the business, enlisting Yale to provide time lock movements for their first branded time locks in 1916. 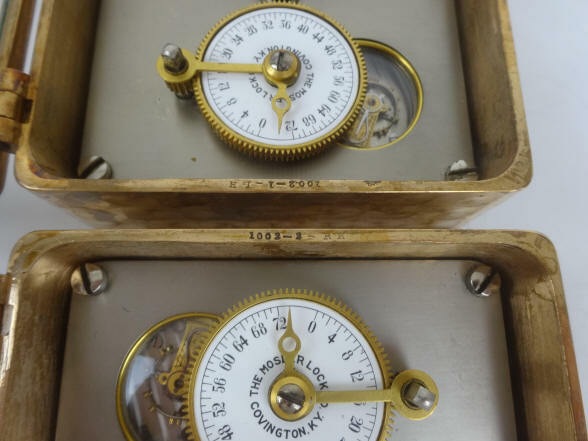 In the example above, the original S&G time lock movement must have needed service just at the time Mosler bought Corliss and Mosler used the existing Banker's time lock inventory for this movement replacement. It certainly would have been easier and produced a more reliable lock to have replace it with a O.E.M. from S&G. But it appears that Mosler wanted to put its stamp on the time lock. If this is so, it's interesting that they did not remove the S&G logo glass. Another alternative explanation is that S&G, unlike Yale, may have refused to provide movements to Mosler, a new competitor, hoping that these modifications may result in a lockout, thus damaging Mosler's reputation in their fledgling time lock business. 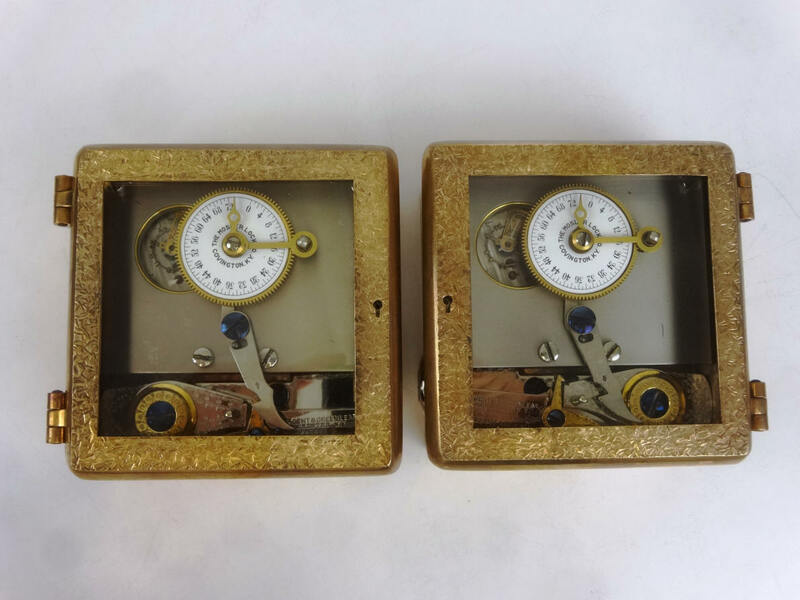 This pair was modified sometime in or just after 1916 by Mosler shortly after that company bought the Banker's Dustproof Time Lock Company and entered the time lock business. It took about a year for Mosler to introduce their own time lock movement design based on an Illinois Watch Co. , Model 4, size #18 movement. The gold plated crackle finish was only used for about one year by Mosler when they entered business in 1916 and before they reverted to the smooth bronze and satin nickel finish a year later. Mosler converted the original S&G door finish in this example to their signature crackle design. The interior door rails as well as the case sides still retain the original S&G spotted damascene design. After Mosler abandoned the crackle design, subsequent modifications did not involve any alteration of the case surface finish. See additional example, C, below. Mosler's second type of conversion used a drop-in module made with their own branded time lock movement.. 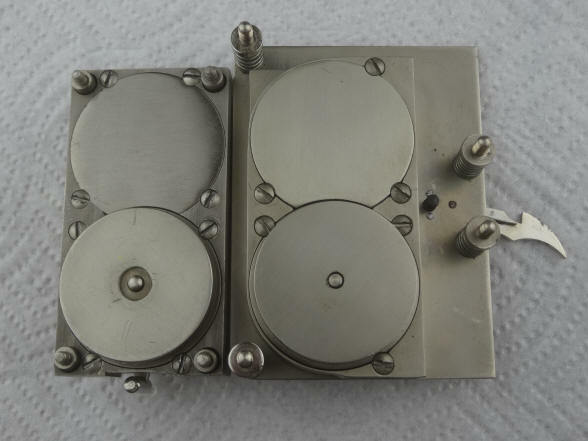 The plate upon which the Mosler movement was attached had screw positions that matched the extant mounting holes in the case and S&G's drop lever. 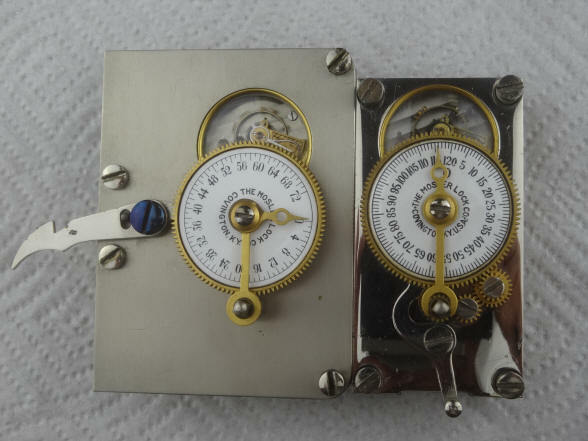 Mosler modified where the drop lever engagement pin was located on the underside of the dial so as to be able to to reuse the existing drop lever. These photos show the sides of the case were left with S&G's original jeweled spotted damascene finish. The second photo shows the case numbers as 1002-1 LH and 1002-2 RH so these cases were the third to be produced in the Model #4 Corliss series. These photos show side by side comparisons of the movement employed by Mosler for this modification as well as a production Mosler movement. Notice in the second photo that the modification movement has no mounting holes drilled into the three corners (one corner has been completely milled away). This, as well as the door finish, precludes the possibility that the modification was done by an aftermarket third party since the production Mosler movements would have had the corner holes before leaving the factory. After market conversions were sometimes done with the S&G single plate movements used in the company's models 2, 3 and 4. Aftermarket examples by Andy Kotas. 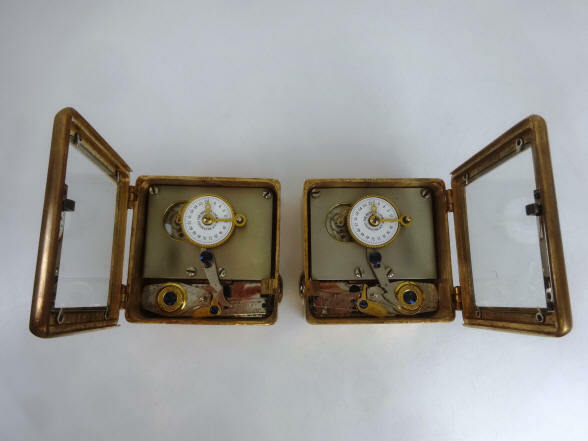 Sargent and Greenleaf invented the first commercially produced practical time lock and made their own movements. Most other firms, notably Consolidated, Yale, and Diebold used movements from outside suppliers mainly E. Howard & Co. Around 1902 Howard exited the time lock business when it was purchased by the Keystone watch company and Seth Thomas filled much of this business. 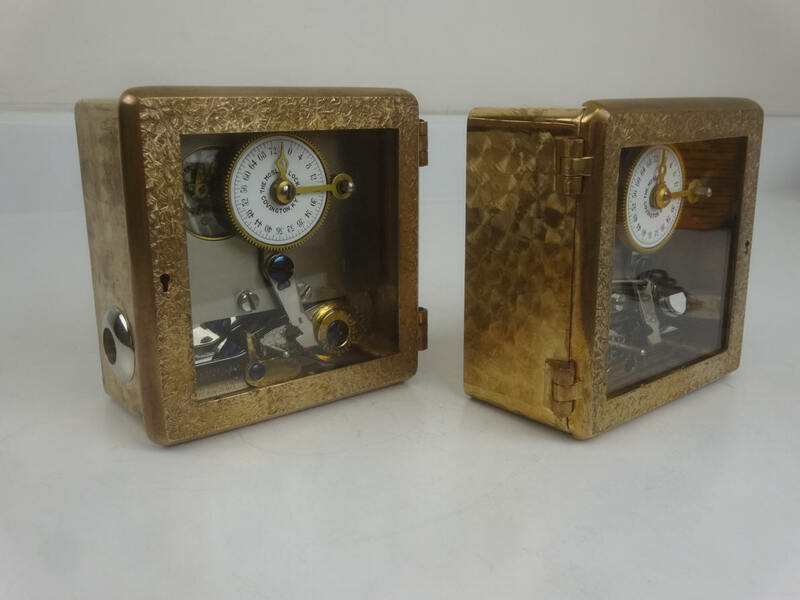 Other time lock makers who arrived later, as Mosler Safe Co., and then Bankers Dustproof, used American Waltham Watch and Illinois Watch Company pocket watch movements. Beginning around the 1950's movement production shifted from the United States to Switzerland. Sargent and Greenleaf ceased production of their own movements due to high domestic costs in 1953. Most time lock modifications were performed on S&G locks since this company made their own uniquely configured movements. Early locks that used less commonly available movements, particularly those before the introduction of S&G's modular style movement lines after 1890 were candidates. Even so, modified locks are quite rare. It was an expensive procedure done from absolute necessity, and the risk of a catastrophic failure, while remote if done properly, was still a deterrent to the conservative banking community and their insurance companies. 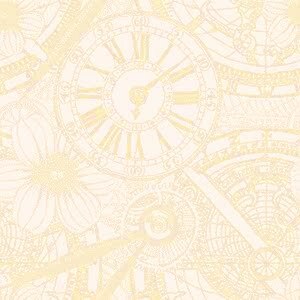 Modified locks are a very sought after subgroup of time locks. Other modified time locks, page one, page two. Below is a photo of a S&G single movement Model 4 in a Corliss Spherical safe. There would have been another on the opposite side of the sphere as these were always found in pairs. Next a Corliss publication illustration of a Model 4 two movement in the style same type of safe. It is unknown if a safe with this configuration was ever made, but there is no reason why it could not have been done. 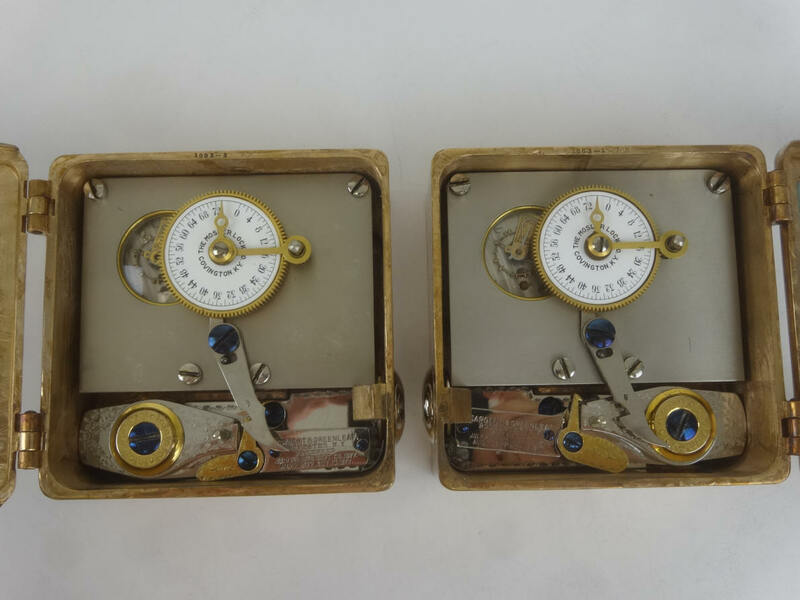 It is unknown if this would have had only one or a pair of of these two movement model #4's, but the pairing is unlikely since no pared cases for the two movement version have been found.